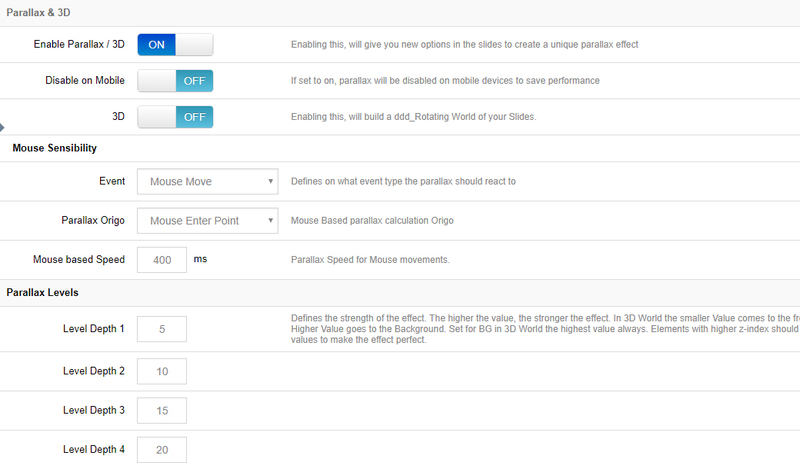 Choose to enable the parallax effect for the slider, and if enabled, choose to disable the effect for mobile only (since parallax is based on mouse movement and page scrolling, parallax usually works best on desktop computers). Choose “Mouse Move”, “Scroll Position” (page scrolling) or “Move & Scroll” (first two combined). “Mouse Enter Point” – Parallax is based on where the mouse first entered the slider. The transition duration for the content’s movement. Use a lower number such as “750” for fast movement, and a higher number such as “2000” for smoother motion. Each individual layer can be assigned a “Parallax Level”. And you can define up to ten different “levels”. Applying different levels to different slide layers is what gives the content its “depth” in relation to other parallax layers. Converts a Parallax effect from a traditional 2D view into a 3-dimensional world. Adds a CSS3 box-shadow to the elements to enhance the 3D visual. Choose to disable the 3D behavior for the slide’s main background image. Then the 3D effect will only be applied to the Slider’s Content Layers. Prevents the slider’s content from protruding past the slider’s normal boundaries. Prevents the slider’s Layer Content from protruding past the slider’s normal boundaries. Helps to prevent Safari-specific 3D issues by separating content along the z-axis plane. The transition duration for the content’s movement. The strength of the 3D rotation on the background and layer groups in relation to mouse movement. The higher the value, the more movement. In a 3D environment, applying different depth levels to different Layers is what brings the 3D world to life.